Home » Texas Rangers » Org charts. There is probably no truer barometer of how the role of the major league manager is valued by front office today than what they are paying major league managers. According to an article by legendary writer Bob Nightengale in USA Today, twenty-one of the thirty major league managers are making $1.5 million or less in salary this season. That’s how little their roles are valued. Only three managers, according to Nightengale, are making more than the average salary of a baseball player, which is $4 million. They are Bruce Bochy, Mike Scioscia, and Joe Maddon, each making $6 million. Terry Francona and Buck Showalter are making $4 million. Five major league managers are making $800,000 or less. That’s not a whole lot more than the $545,000 major league minimum for a player. 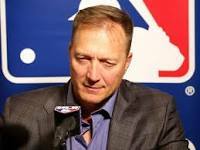 Rangers manager Jeff Banister earns $950,000. Contrast that to when Joe Torre managed the Yankees. He made $7.5 million a season. Of course, he won a handful of World Series rings. The all-powerful Tommy Lasordas and Tony LaRussas and Sparky Andersons and Bobby Coxes are a thing of the past. The major league org chart used to resemble a powerhouse college football program. Just as at most universities, the Athletic Director tops the org chart but he answers to the head football coach, in baseball the GM was the boss but the manager called the shots. Not anymore. The day of kingpin major league managers is gone. It has been replaced by the manager as front office errand boy. As Nightengale points out, most managers have no control over the lineup and don’t have much say in personnel decisions. It all comes from the top, from the GM and his numbers guys. Geeks are finally in charge. Joe Maddon equated the role of today’s manager to that of a White House press secretary, just there to field questions and dispense answers about decisions made by those in charge. Only, keep up the illusion that you are in charge. Which leads to the question, how long until the manager as a former player concept goes away? When do they become PR guys? When is the GPA on a potential manager’s resumé worth more than the ERA on his baseball card? It’s not a role where extensive baseball knowledge is needed anymore. That is being handed down from above. So, when Rangers fans vent their anger at Jeff Banister, it’s misplaced. He’s just the messenger. Pretty soon he will be working for tips. How the Rangers hit against Bassitt (unavailable). How the Athletics hit against Gallardo. Good discussion Kev…..will say that all the Mgrs you mentioned are deserving except for Sosh…..and the Torre. Torre was a failure at multiple stops…when he got to the Skanks and their exorbitant payroll he succeeded. What made Torre successful was managing high paid, huge egos and bonding the team.I have personally long subscribed to all Mgrs or anyone else for that matter is not a success on all facets of the game. Wash was a great teacher and stood his ground vs Harvard boy but was prob not the best game Mgr. Maddon is a visionary but over thinks some times like LaRussa. Buck is highly intelligent but needs to be a GM or Prez not a Mgr. Bochy lets his guys play. Hinch is terrific with younger players. Francona is the best IMO. Banny even has the talent for motivation, just would rather have him in my foxhole not my bench. Yeah, I thought the article was insightful. Really gets at how the role of manager has changed and why so many guys with so little experience are being entrusted with teams. Because they are just the mouthpieces. Yep…..the trend that was finally adopted was going with the younger minds as opposed to the older retreads….Hinch.Cora,Kapler….guys that embrace metrics but don’t let it control their decisions, Its where Hinch separates from the pack…..relies heavily on metrics but thinks for himself. Josh Reddick was platooned by the As and Bosox, first year with the Stros batted .300+ agst LH pitchers…..and my fav quote was about Gurriel..He said sometimes you have to throw away the book and let them play. Another dynamic that I personally embrace is the success of past catchers as Mgrs……Gives them great vision for the games. I posted this really late last night, so I am reposting it on today’s page. It should be a video with Jared Sandler and Joey Gallo. Drifters playing at the Levity in Arlington Sun night….up on the roof or under the boardwalk..
Are the days of old-school coaching (college or professional) in any sport a thing of the past? You’ll never have any coach work with the ethics nowadays of types like Bear Bryant, Bobby Knight, Red Auerbach, Mike Ditka, Scotty Bowman, Casey Stengel, etc. The list goes on. If any tried to coach or manager with the old-school approach today, players would call him a tyrant or quit on him in a heartbeat as well as having the team’s front office or athletic director call him out (or even fire him) for such behavior. Nowadays it seems like the players seem to coach the teams they play for and not the coaches themselves. I think it’s called the Lebron Effect. I think that still exists in college football. Take a guy like Nick Saben. Do you think the AD tells him what to do? No way. NOBODY tells Popovich what to do or how to coach. And if players don’t play the way Pop says they don’t play or they get traded. Yeah, I think there are a lot of coaches outside of baseball like that. For the hoardes of Banny fans here at RR3….. I would have liked to think Michael Young would eventually take over as manager, but I think he wouldn’t fit the mold of the modern manager. He wouldn’t be a yes man. That’s the problem with today’s managers, too many Yes Men. The attachment brings up several threads….not sure what you are wowing?? Probably the announcers duking it out. Their green shirts are also somewhat stinky. Let Gallardo pitch, it’s not like the Rangers are going to win this one. Come on Conner, you can get out of this. He’s about to give up runs. I’m hoping he learns how to get out of jams like this while it doesn’t count. well he escaped . . . this time. Good job on the strikeout Conner! Woo Hoo! He did it! Did the Rangers finally tank,,,,,,playing crap ball the last week??!! ← Another rough start for Bartolo.